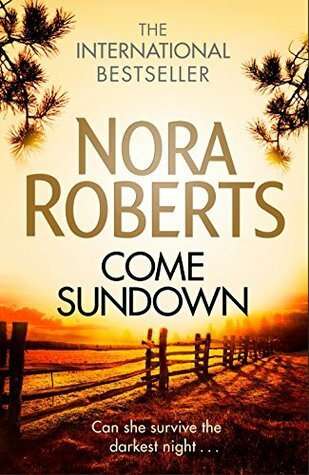 All I can say is Nora Roberts does it again with Come Sundown. There is mystery and crime, strong women, a beautiful ranch and resort in Montana, family and friends, romance - all of which combine into making a downright good read. Bodine - the heroine is a strong, feisty woman and boss, she runs the resort side of the family business really well. She comes from a strong line of women - there's Miss Fancy her great grandmother of 89 years, Cora her grandmother and Maureen her mother. And don't think Miss Fancy sits all day in a rocking chair, don't offend her with that. She can still ride out when she wants over the ranch. One of the laughs I got from this book was a tee shirt she turned out in one time with a really apt and clever slogan on the front. Not going to spoil it for you though, you just need to come across it. There is darkness in this novel, Bodine's Aunt Alice went missing, she was a little of the black sheep of the family and had left home to do her thing. However she is taken hostage by a very bad guy and lost to the family. Bodine and her two brothers have never met her or seen her. At times we get the viewpoint of this evil, ugly man and for some that could be off putting. But so far one thing I can say is, Nora Roberts never lets the bad guy win - so hang in there. These dark spots are juxtaposed against family, life on the ranch and resort. Family bonds are so strong and when Callen rides in on his amazing horse life gets even better. He is a long time friend of Bodine's brother Chase, returning to his place of birth after time in Hollywood training horses. Soon he is very much involved in life on the ranch and resort. And dang it. That horse of his, there is something magical about it. I love the title of this book and how it relates to the story, won't give it away, but its perfect. At times during the reading I shied away from the ugly, caught my breath at the very emotional points and chuckled at some of the humour that sprang out in places. If you decided to read her again, try The Obsession and The Search. They're my two favorites of hers. I have read so many of her books and this one sounds so good! Thanks for sharing. There is nothing more I love a good thriller. Where did you get your genre icons ? they are so adorable! Cindy I made them. On picmonkey. Just squares of colour, plus free little clips found on internet. Mostly pixabay. I'm not sure if I've read a novel by Nora Roberts, even though she has written many. I'm glad you enjoyed this one. It sounds very interesting. I was on the fence about this one because it does look so dark but I think I'll have to give it a try. You're right - Roberts doesn't let the bad guys win in the end though it can be iffy getting there! Glad you enjoyed it and thanks for reviewing! I think this is going on my read pile after all. I'm so glad I bought this one!!! Happy to see you enjoyed it so much. Sounds like I must pick up this book! I love a lot of NR's books, especially when there is mystery and crime set against family moments. I almost got this book. Looks like I should have ... and still should. I'm glad this was a good one. I put a hold on it at my library. Hope you enjoy it. I did read The Obsession and not quite sure about The Search - will have to look that one up. Adding this to my Audible wish list! I was also wondering about the icons - they are terrific. Wonderful that you made them yourself!